I cannot get this package to install. After following the instructions, it says it isinstalled but dosnt show any icons. Make sure you have actually placed the "Legends" folder containing the icons , inside the IconPackager folder. I'm also assuming that your main Hard Drive is labeled as the "C" Drive. These go perfectly with the Aragon WB I am currently working on. Excellent work Ace! Thank -you LS , When I first saw your Blind, I was thinking the same thing. [e digicons] [/e] [e digicons]:thumbsup:[/e] beautiful Blind by the way. I cannot get this package to install. After following the instructions, it says it isinstalled but dosnt show any icons. The only way that could happen is if you put the folder containing the icons in the wrong directory or location. 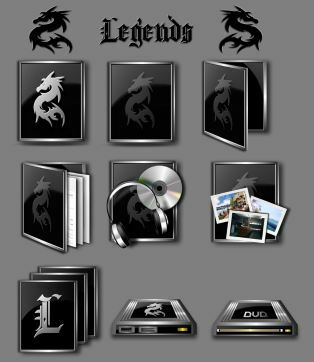 The proper location as per the included instructions is : C:\Users\Public\Public Documents\Stardock\IconPackager Make sure you have actually placed the "Legends" folder containing the icons , inside the IconPackager folder. I'm also assuming that your main Hard Drive is labeled as the "C" Drive. What I was doing wrong was moving the folder to my Stardock\IconPackager folder then clicking on the installer. I installed it by moving the folder to the IconPackager folder, then open IconPackager and install it from there.